The Knights have five individual champions on their way to the regional title. 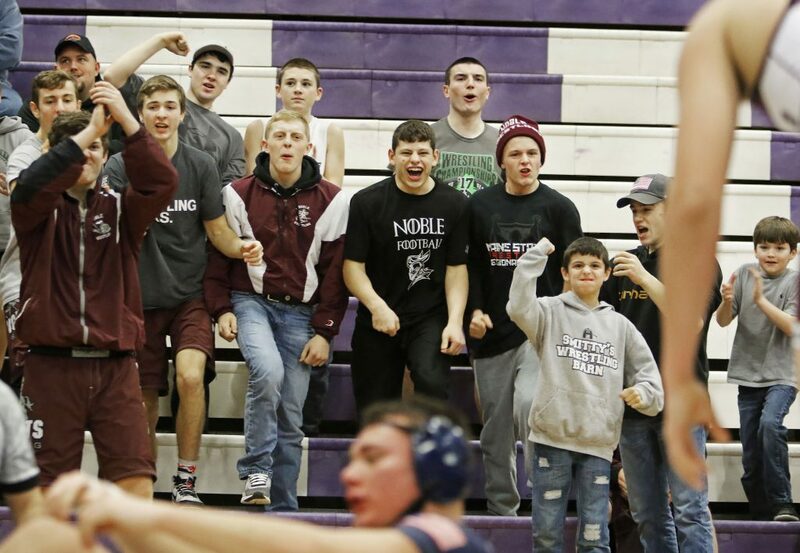 SOUTH BERWICK — Noble High wrestling and its fans invaded enemy territory and for the first time since 2011 conquered the field when it mattered. 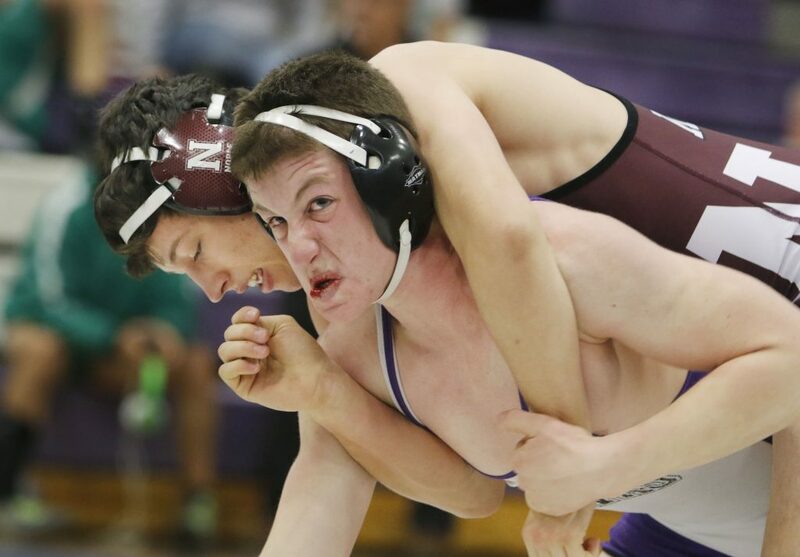 The Knights won the Class A South regional championship Saturday and they did it at Marshwood – their old rival, the defending state champion, and the program that had taken Noble’s mantel as Maine’s best wrestling program. Noble finished with 200.5 points, five regional champions and 10 wrestlers who finished in the top four to qualify for the Class A state meet next Saturday at Sanford’s Memorial Gym. Marshwood was second with 150.5 points, followed by Sanford (123.0) in third. The Hawks won their fifth state title in six years in dominating fashion last year but were down to just nine wrestlers for the regional because of low initial turnout, injury and ineligibility issues. Seven reached the championship round and those seven will go to states, which figures to be a hotly contested tournament with the South’s top two and the North quartet of regional champ Nokomis, runner-up Cony, Oxford Hills and Skowhegan. 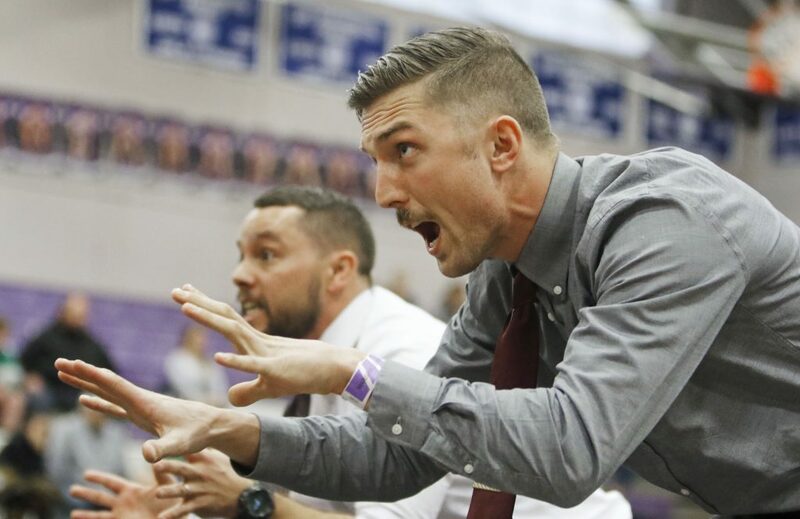 Gray, a former Noble wrestler and assistant coach, is in his first season as head coach. He replaced the retired Kip DeVoll, who built Noble into a powerhouse that won 11 Class A titles in 13 seasons between 1999 and 2011. Noble went 5 for 5 in championship matches, including three straight against Marshwood wrestlers. Freshman Josh Cote started the championship drive with a technical fall victory against Carsen Godwin of Marshwood at 120 pounds. 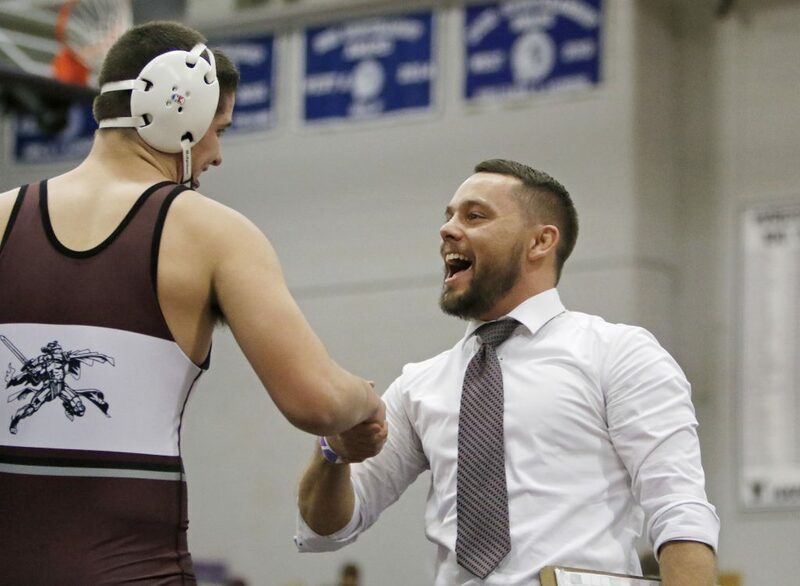 His win clinched the team title for the Knights, who had built a significant lead in the consolation semifinal rounds, much to the delight of a large, vocal cheering section that included DeVoll. Then came Sam Martel and Pilecki pinning their Marshwood foes Liam Coomey and Matthew Thompson at 126 and 132. Noble’s other individual champs were Jonathan Grenier, who pinned top seed Jeremy Sendrowski of Scarborough in the 145-pound final, and Hil Keisker at 160. Marshwood’s champions were David Spinney at 138 and defending state champion James Thompson at 195. Kennebunk junior Alden Shields (113 pounds) won his first regional title after finishing third the two previous seasons. Sanford dominated the upper weights. Sam Anderson (170 pounds), Isaac Plante (182) and Nick Works (220) won titles, and Sol Demers was third at 285. “It’s just us working together. Getting better,” said Anderson, the 2017 state champ at 160. Portland’s Zack Elowitch, recovered from a January concussion, won the 152 title. Colby Frost of Bonny Eagle won at 106 and Cheverus heavyweight Zebulun Leavitt beat Scarborough’s Lincoln Andrews 4-3 in overtime. Receive high schools sports news and scores in your inbox from preseason to the state championship games by entering your email address below.